The 1995 Mustang GT received the 215hp 5.0L V8 engine, lower front valance integrated fog lamps, rear spoiler, roomier seats, standard anti-lock brakes, and a four-wheel disc brake system. The only way to get a 1995 Canary Yellow or 1995 Sapphire Blue Mustang was to buy a Mustang GT. Canary Yellow and Blue were two colors reserved only for the Mustang GT coupe or Mustang GT convertible. Here is Joanna Rinaldi in her Black and Tangerine 1995 Mustang GT coupe. Jonna tells us, "This car was originally purchased for 1800.00 cash and then brought back to life again. It has never been wrecked it was just really abused when I got it." Crystal White 1995 Mustang GT convertible owned by Karen Baum from Wayne, Pennsylvania. This was our featured Attitude Of The Week photo for the week starting 9-27-09. Karen tells us more, "I got it in 1997 seeking the last 302 of the time. I found out later this is a rare, 1 of 36 made, Crystal White convertibles with Bright Red Leather interior. It is all stock except for Chrome Cobra R rims and changed the white top to black when needed to be replaced." 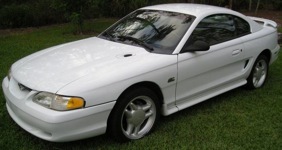 Crystal White 1995 Mustang GT convertible owned by John Yow from Georiga, John Shares, "My dad bought this car in 1996. He has babied it and took great care of her. He recently purchased a 2007 mustang gt and handed this one down to me. It has the original motor with 300,000 miles on it." Canary Yellow 1995 Mustang GT convertible with a 215hp (at 4200rpm), 5.0 liter, V8 engine. Sapphire Blue Mustang GT convertible with a 215hp (at 4200rpm), 302 cubic inch (5.0 liter), electronic fuel injected V8. Black 1995 Mustang GT coupe owned by Frances Kasik from Chiloquin, Oregon. It has the 5.0L HO V8 engine and a manual transmission. Deep Forest Green 1995 Mustang GT convertible owned by Erric Bresmon from New York. It has a 351ci engine, a manual transmission, Roush body kit, and tons of other items. Check out the last photo in this series for a total list. Erric tells us, "I purchased in 1998. It had 27,000 miles on it. Now it has 28,000. I have over $60,000 invested above original cost of car. All high dollar items were installed. The engine worth over $20,000! This cars suspension is set for track use as well. Car is 1 of 1002 produced in this exterior color. Even fewer produced with this 5-speed, interior combo. This car is absolutely beautiful . This car was built for my son." Deep Forest Green is paint code M6572 which is known as Dark Tourmaline on other Ford models. Triple Black 1995 Mustang GT convertible owned by Bryan Nedwed from New Jersey. This is our featured Attitude Of The Week for the week starting September 27, 2015. It has the 5.0L V8 engine and an automatic transmission. Bryan tells us, "Had her for a year love it and I'm a Chevy guy. It a little slow but fun to drive. Mods; straight pipes, 18 inch Cobra rims, trick flow intake, GT 40 heads, Lunaticam 488 lift 234 duration, and 411 gears." Yellow 1995 Mustang GT convertible owned by Dominick Tolotta from Cape Canaveral, Florida. Dominick tells, "I found my Mustang on Craigslist. The owner's wife was expecting their third child and he needed to sell the car. It was in rough shape. The paint was destroyed and so was the interior. I also did a lot of work to the engine. It's a 5.0 bored .60 over with a f303 cam. A T5 transmission with a short shifter. An aluminum drive shaft and 4.10 gears. I'm still working on improvements. I don't think I'll ever stop!" Red, White, and Blue 1995 custom Mustang GT with full Saleen body kit, Cervini hood, Saleen rear spoiler, Ford Motorsports 17 x 9.5 Cobra R wheels, Nitto 555 275/40 - 17 tires, and a 347ci Terry Iselin Race engine under the hood. Opal Frost 1995 Mustang GT owned by Jennie Penfold from Fareham, Hampshire, England. Jennie tells us, "I bought car in January 2015. The previous owner bought it a year earlier as a standard Mustang and did quite a bit of work on it. The rims are 18" XXR 527's in black chrome staggered fitment 8.5 on front with 265/35x18 Accelera PH1's and 10" on rear with 285/35x18 Pirelli P Zero Rosso's, with Focus RS Brembo 4 pot front brake conversion. I have replaced the discs with 330mm drilled and slotted ones, and EBC yellowstuff pads as the standard discs were warping. Pypes performance 'X pipe' (imported from states) from factory headers to straight thru Flowmaster silencers and stainless tail pipes. Full MSD ignition upgrade with Blaster coil. SR cold air feed inlet kit. LED projector lights. I have added a grille as it looked odd without one! Also added the roof and boot stripes which I think finish it off perfectly." Deep Forest Green 1995 Mustang GTS coupe owned by Jan Meyers from Olivehurst, California. It has the 5.0L V8 engine and manual transmission. Jan says only 1002 were in Deep Forest Green. This GTS has some modifications; Cobra front bumper, aftermarket hood, and spoiler. Nice job. The GTS model was a GT with base level items such as the cloth interior, no fog lights, and no spoiler. Crystal White 1995 Mustang GT coupe with a 215hp (at 4200rpm), 5.0 liter V8 engine. Deep Forest Green 1995 Mustang GT convertible with a white leather interior and white top. It is equipped with with power windows, power locks, power mirrors, cruise control, tilt wheel, automatic transmission, power convertible top, lumbar seats, AM/FM stereo with CD player, anti-lock brakes, air conditioning, and dual airbags. This is a Laser Red 1993 Mustang GTS coupe. A GTS was basically a stripped down GT. They had many of the Base V6 characteristics, but with the GT engine and badging. They came without rear decklid spoilers, fog lamps, and front air dams. They did have the GT emblems and Mustang GT embossed into the rear bumper. Their interiors were cloth and contained all other Base V6 items but with the GT instrumentation. The GTS model name was only available in 1995, but you could get it as an option through 1998 as the 248A package. This yellow 1995 Mustang GT coupe was on display a car show run by the Central Illinois Mustang Association. The show was at Dennison Ford in Bloomington, Illinois. It has a huge spoiler, billet grille, projector headlights, and blacked out windows. Vibrant Red 1995 Mustang GT convertible with a black gut and black top. Vibrant Red is one of THREE red paints offered on the 1995 Mustang. It's the brightest of all of them. Compare them on the 1995 Mustang Brochure.